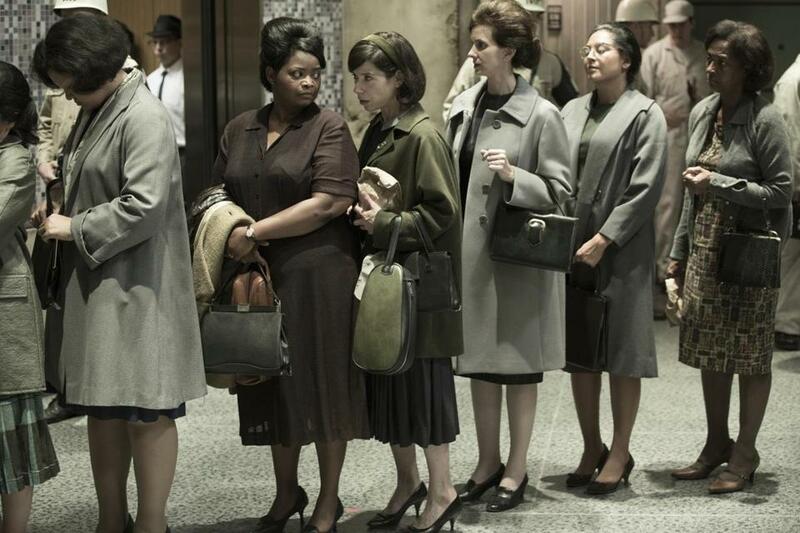 Sally Hawkins (center) and Octavia Spencer (second left) in a scene from the film "The Shape of Water." NEW YORK (AP) — Guillermo del Toro’s lavish monster romance ‘‘The Shape of Water’’ fished out a leading 13 nominations, Greta Gerwig became just the fifth woman nominated for best director and ‘‘Mudbound’’ cinematographer Rachel Morrison made history as the first woman to earn a nod in that category in nominations announced Tuesday for the 90th annual Academy Awards. The cascading fallout of sexual harassment scandals throughout Hollywood put particular focus on the best director category, which for many is a symbol of gender inequality in the film industry. Gerwig follows only Lina Wertmuller, Jane Campion, Sofia Coppola and Kathryn Bigelow, the sole woman to win (for ‘‘The Hurt Locker"). Also nominated for best director was ‘‘Get Out’’ director Jordan Peele. He becomes the fifth black filmmaker nominated for best director, and the third to helm a best-picture nominee, following Barry Jenkins last year for ‘‘Moonlight.’’ The film’s breakout star, Daniel Kaluuya, also was nominated for best actor. Christopher Plummer, who replaced Kevin Spacey in Ridley Scott’s ‘‘All the Money in the World,’’ also sneaked into best supporting actor category. Plummer was added to the film in reshoots little more than a month before the film’s release. Perhaps most unexpected was the broad success of Paul Thomas Anderson’s ‘‘Phantom Thread,’’ which scored not just a best actor nod for what Daniel Day-Lewis has said is his final performance, and best supporting actress for Lesley Manville. It also scored nominations for best picture and Anderson’s direction. Anderson likely displaced not only Steven Spielberg ("The Post") but Martin McDonagh, the director of the film many have tapped to win best picture, ‘‘Three Billboards.’’ His absence is a major knock for a film that has endured the harshest backlash of the contenders, with many claiming it’s out-of-touch in matters of race. Still, ‘‘Three Billboards’’ scored seven nominations Tuesday, behind only ‘‘The Shape of Water’’ and Christopher Nolan’s ‘‘Dunkirk.’’ The World War II epic, thus far little-honored in Hollywood’s awards season, emerged especially strong with Oscar voters, taking eight nominations, many of them in technical categories. Though the favorites thus far have been largely independent films, a number of blockbusters fared well, including five nods for ‘‘Blade Runner 2049,’’ four for ‘‘Star Wars: The Last Jedi,’’ three for ‘‘Baby Driver,’’ two for ‘‘Beauty and the Beast’’ and two for Pixar’s ‘‘Coco,’’ which is up for best animated feature. Still, Patty Jenkins’ ‘‘Wonder Woman,’’ which became the highest grossing movie ever directed by a woman, failed to receive any Oscar nods despite an awards campaign. But the box-office hit that carved the most unlikely path to the Oscars was ‘‘Get Out.’’ It opened back in February on Oscar weekend, and went on to pocket $254.7 million worldwide. It scored four nominations. 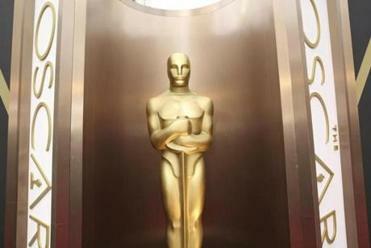 Though many minorities were still absent from the acting categories, the film academy put forward a field of nominees almost as diverse as last year when ‘‘Moonlight,’’ ‘'Fences’’ and ‘‘Hidden Figures’’ powered a rebuttal to the ‘‘OscarsSoWhite’’ backlash of the two years prior. Four black actors — Washington, Kaluuya, Mary J. Blige ("Mudbound") and Octavia Spencer ("The Shape of Water") — are among the 20 acting nominees. Meryl Streep, who stars as Washington Post publisher Katharine Graham in ‘‘The Post,’’ notched her 21st Oscar nomination. 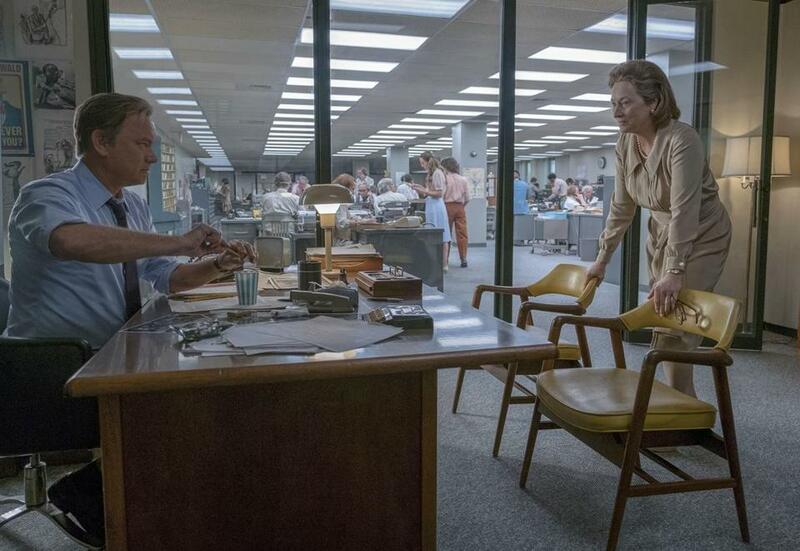 Tom Hanks portrays Ben Bradlee, (eft) and Meryl Streep portrays Katharine Graham in a scene from "The Post." Though the show ran especially long, at three hours and 49 minutes, it finished with a bang: the infamous envelope mix-up that led to ‘‘La La Land’’ being incorrectly announced as the best picture before ‘‘Moonlight’’ was crowned. But the movie business has larger accounting problems. Movie attendance hit a 24-year low in 2017 despite the firepower of ‘‘Star Wars: The Last Jedi,’’ ‘'Beauty and the Beast’’ and ‘‘Guardians of the Galaxy, Vol. 2.’’ An especially dismal summer movie season was 92 million admissions shy of summer 2016, according to the National Alliance of Theater Owners. It was a dominant if bittersweet day for 20th Century Fox. Its specialty label, Fox Searchlight, is behind both ‘‘Three Billboards’’ and ‘‘The Shape of Water,’’ and Fox released The Post.’’ Yet those wins may soon count for the Walt Disney Co., which last month reached a deal to purchase Fox for $52.4 billion. Both Amazon and Netflix failed to crack the best picture category but earned nominations elsewhere. Netflix’s ‘‘Mudbound’’ scored two nods (for Blige and Morrison) and Amazon’s ‘‘The Big Sick’’ grabbed a nomination for Holly Hunter in the same category. ‘‘The Big Sick’’ also scored an original screenplay nod.